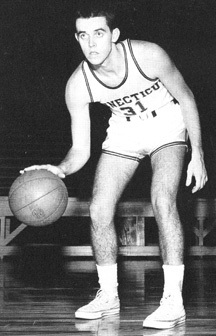 Jim O’Connor was a Guard for the UConn Huskies from 1955 – 1958. He’s a member of the UConn Basketball All Century Ballot, was a member of three consecutive Yankee Conference Championship teams, and National Collegiate Athletic Association Tournaments. He also earned All-Yankee Conference First Team honors as a senior. I spoke with Jim in August 2005, about his collegiate, and post-collegiate basketball, and career memories. Jim began enjoying, and playing basketball as a youngster in the fourth grade, around age 10. “I remember just becoming totally immersed in basketball. There were hardly any outside courts but the point is, we found them” He delivered newspapers, and would find a muddied, non-gravel area with a garage, and a hoop, and he’d play, seeking any opportunity he could to play. Jim also listened to the UConn games on the radio. Prior to entering high school, Jim’s brother who was a student at UConn took Jim to his first UConn game at “the old cage” and that inspired Jim even more. Jim went to Buckley High School in New London, CT for two years until it closed. He then went to New London High School for two years. At both schools Jim experienced winning the New England Championship, which includes schools from Maine, New Hampshire, Vermont, Massachusetts, and Connecticut. He also enjoyed winning the State Championship at Buckley. While at Buckley High School, Jim’s team won the State Championship, and the New England Championship. In New London, his team lost the state championship but since the winner, and the runner up go to the New England Tournament. Jim’s team went to the New England Tournament, and won the championship. They beat the team that had beaten them in the state championship. “In high school I was fortunate to be able to win New England Championships at both schools that I went to.” Jim enjoyed his high school basketball teams. “We had a team of guys that each averaged around ten points. We were very team oriented. We all contributed.” During high school, Jim and Donny Burns (another former UConn basketball player) and friend of Jim’s, went to UConn games to watch the two former New London players, Art Quimby and Gene King. These trips to UConn were motivational and inspirational opportunities for Jim. After high school Jim went to Tabor Academy, a prep school in Marion, Massachusetts. “It was that year, that I became even more interested in UConn. UConn was making a name for itself as they beat Holy Cross.” Holy Cross was a powerhouse at the time so when UConn beat them, it was a milestone. There were three other players on the UConn team that were from New London so between the New London ties, and the name UConn was starting to establish, Jim made his decision to go to UConn. During Jim’s sophomore year, his first year on the varsity team, he played a lot. “I was off the bench, and I’d go in, and play upwards of half the game in the second part of the season.” As a junior it was probably Jim’s personal best year, and as a senior he was captain of the team. The team’s records while Jim was at UConn were like 17 wins and 10 losses, and 18 wins and 9 losses. Winning the Yankee Conference Championship each year was an accomplishment and your team automatically went to the National Collegiate Athletic Association Tournament. Jim remembered in one of those years, UConn won the first round in the NCAA’s, which only included 32 teams making it to the Final 16. Jim’s best game was in the NCAA Tournament against Syracuse at Madison Square Garden. He had 22 points. The team didn’t win, which was disappointing, but it was at MSG, and Jim had lots of friends, and family at that game to see him play. Jim graduated from UConn with a Bachelor’s Degree in Business Administration. He continued to play basketball in a semi-pro league, and had the opportunity to play in opening games, prior to pro teams, like the Boston Celtics. He enjoyed this league because it gave him the opportunity to continue playing basketball. It’s hard to finish college, and conclude basketball. Jim was a sixth grade teacher at Claude Chester Elementary School in Groton, CT for 13 years. Next he became Assistant Principal and School Administrator for twenty-five years for the Groton School System until he retired about five years ago. Jim and his wife, Marsha, (who is a school psychologist, also in the Groton school system) have been married for 44 years. They have three daughters, Doreen who lives in Boxford, Massachusetts, Dianne who graduated from UConn, and resides in Groton, CT, and Kristen who also lives in Groton. Jim’s son, James, Jr. had a rare form of cancer, and passed away at the young age of 16. Jim and Marsha have seven grandchildren, and an eighth on the way. During retirement Jim enjoys spending time with his family, and help out with babysitting the grandchildren when he can. He also enjoys staying active, jogging and playing tennis. Jim is proud of graduating from UConn. He stayed at UConn an extra year to finish some coursework, and that’s when he saw the shining light. During that year, he reflected on his basketball career at UConn, and how sometimes you can confuse priorities, basketball versus academics. He was ready to graduate, and start a new career. He understood the order is academics first, basketball second.